and a jumper made of black Geiger wool. If you are in the vicinity and would like to come to the show December 7 1pm -4pm, , just let me know and I’ll give you directions. If you love something you see, let me know that too, and we can make arrangements. 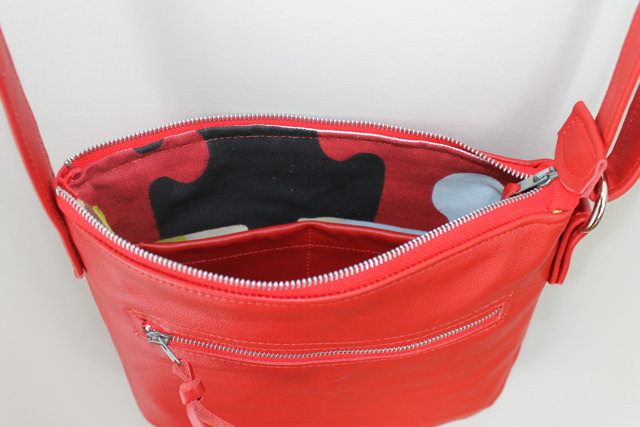 I have gone through two travel pouches in the last couple of years–and found neither to be what I really wanted or needed. Both were cloth and picked up travel grime and neither were quite right in design. I wanted something that would give easy access to my passport and boarding pass but also have a secure spot for currency. 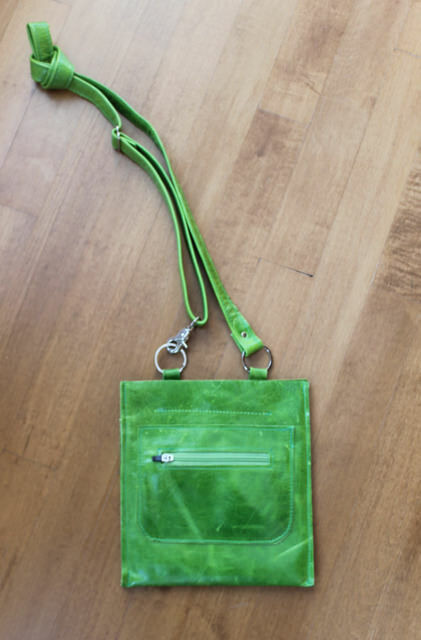 Something I could wear around my neck securely in the airport but would transform to a little shoulder bag once I was moving about in the new location. So…I came up with my own design. This is the prototype. It has an adjustable strap, two zipper pockets, exterior and interior, an open back pocket for boarding pass and two compartments inside for passport and other necessities. 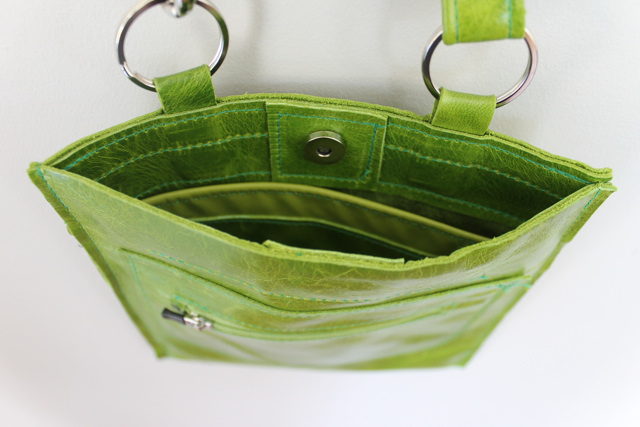 It is 7.5 x 8″, unlined kiwi leather with a magnetic snap closure. Last year when I was in Austria I visited the Geiger factory and brought home some ends of their wonderful boiled wool. 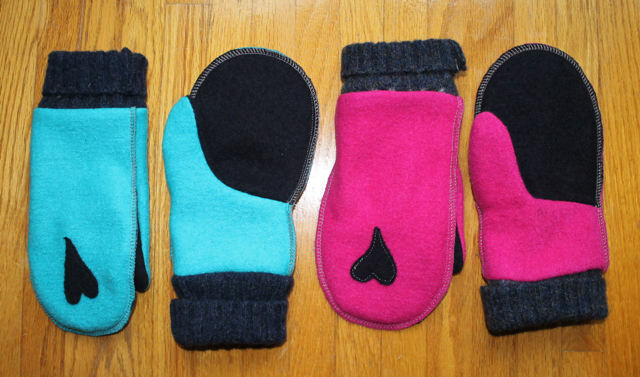 I had made one pink pair, but this week have been also working with the turquoise, navy and moss. The Geiger wool is the most beautiful I have worked with. It is like velvet. 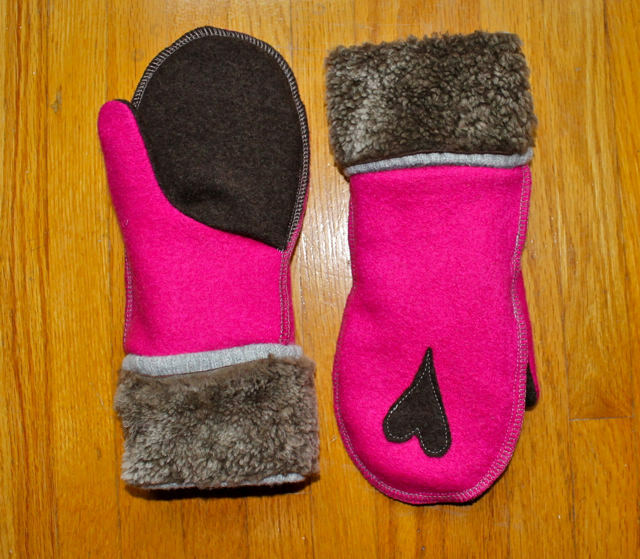 And they are great with shearling. I’ve also made a jumper out of the navy–and will show you once my model visits. 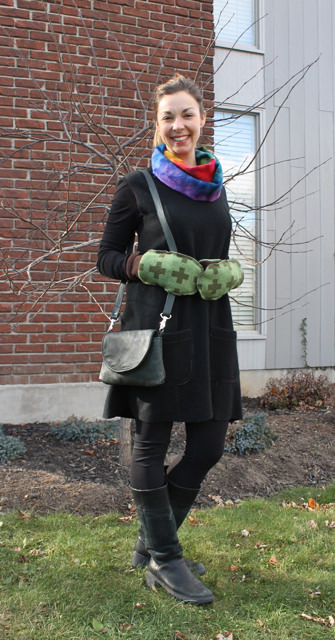 And I had to share this photograph of a much loved birdbrain bag. A friend visited today with her bag which has been in daily use for three years plus. And it is still going forward–a testament to real leather and craftsmanship. I wanted to make a small bag that would carry all you need to go our for an evening. 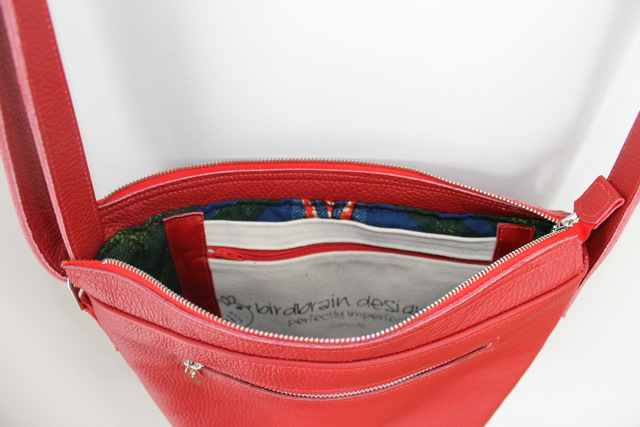 This is the Elizabeth, 10.5 inches wide and 5.5 inches deep with a secure zipper pocket beneath the flap and two large slip pockets inside. 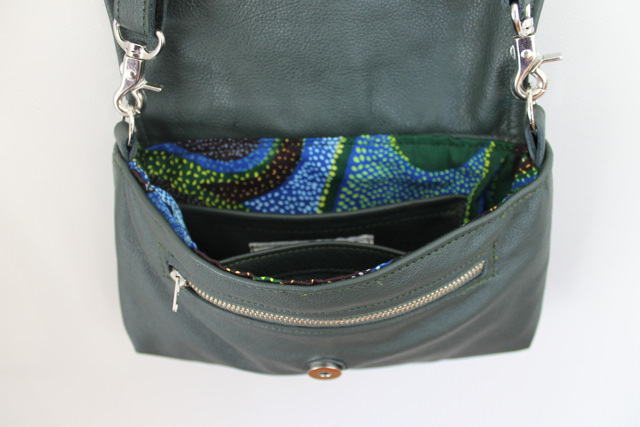 It is made of the softest bottle green leather and lined with a bright cotton pattern from Kenya. 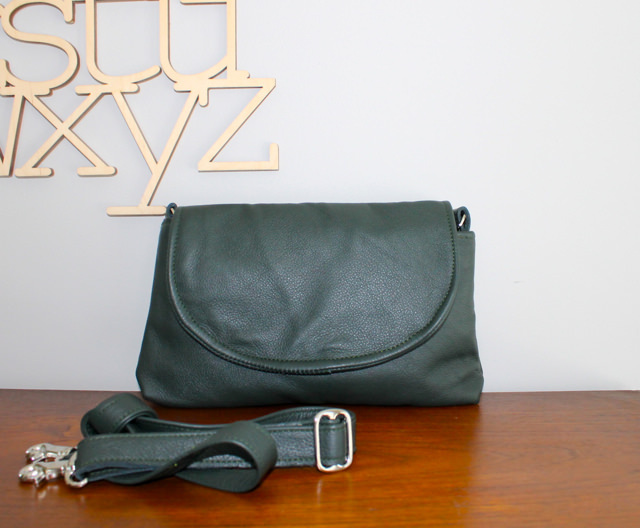 The flap closes with a magnetic catch and the shoulder strap easily clips off and to transform the Elizabeth into a great pouch. 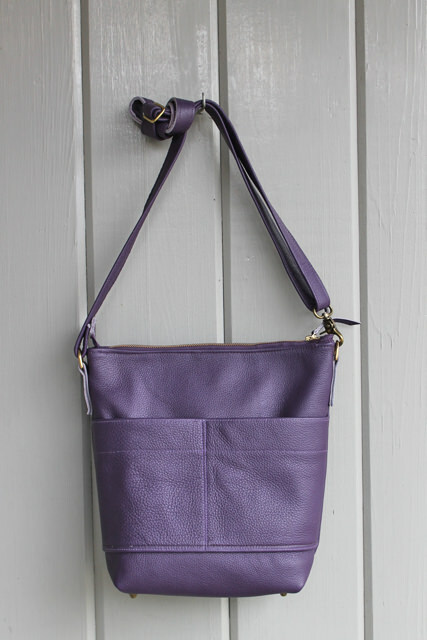 I was delighted to find this pebbly leather in purple. 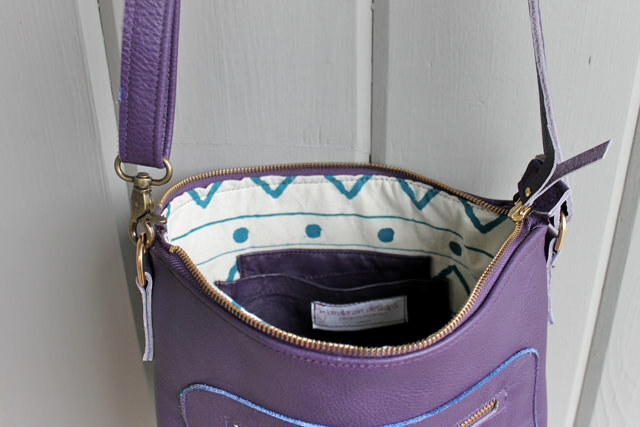 It makes a great durable bag with lots of pockets to organize all your essentials. 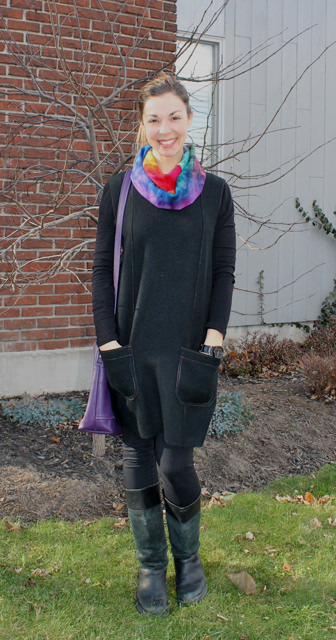 On the front it has two deep slip pockets and on the back a zippered pocket. 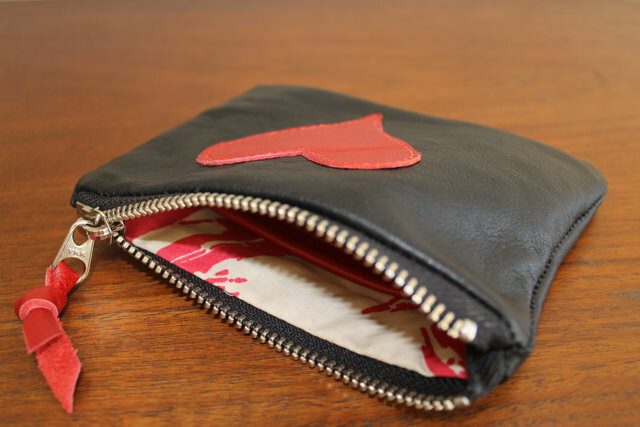 Inside there are three leather slip pockets. 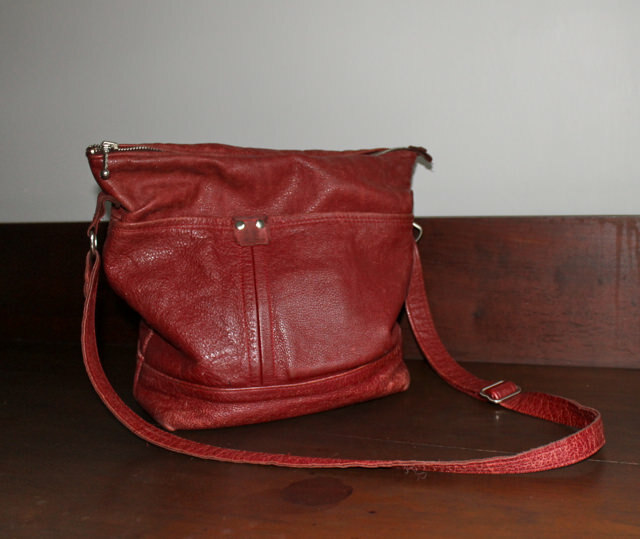 It has an adjustable shoulder strap, metal protective feet on the double leather bottom. Inside it is lined with cotton screenprinted with birdbrain graphics. Width 12″, length 11″ and depth 4.5″. 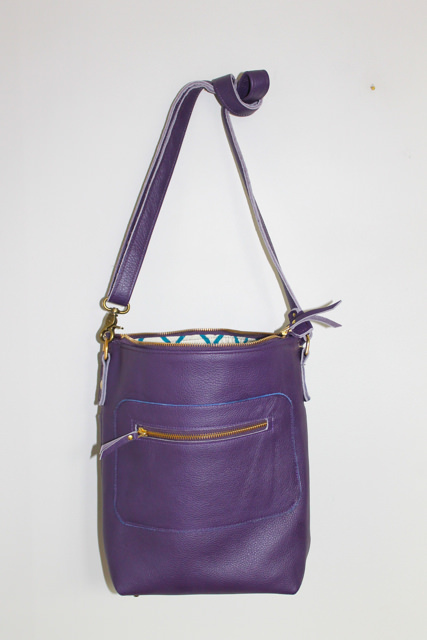 It has solid metal fixtures including the zippers and is double stitched throughout for strength. Hello again, finally. I’ve missed you all. I don’t think I’ve been away from the blog so long since I started it in March 2011. I’ve been fighting a nasty cold for the last week or so. 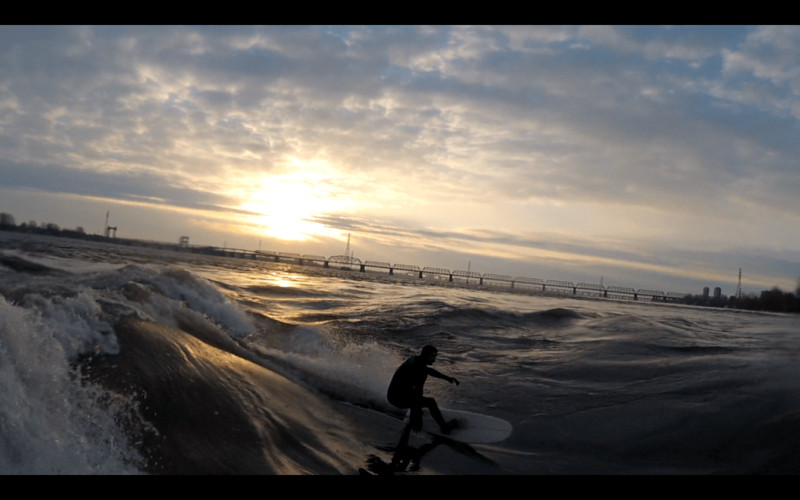 The picture above is of my older son surfing on the St. Lawrence in Montreal yesterday . Evidently, he enjoys this weather! It makes me shiver to look at him! Here inside wearing three sweaters I’m back to about 70% and want to show you the few things I’ve been making. Yes, the making continues, no matter what. 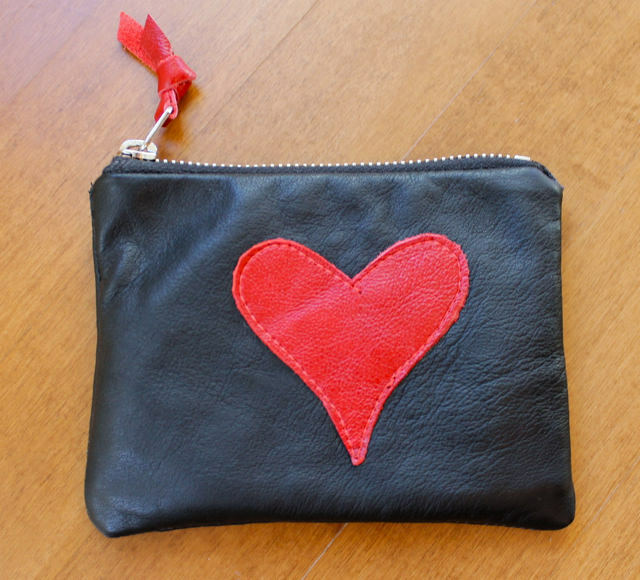 We are planning a few changes to the blog so that you will be able to check out the various styles of bags and pouches in a leather gallery. I hope to introduce that very soon and to give you some info about the on-line store. 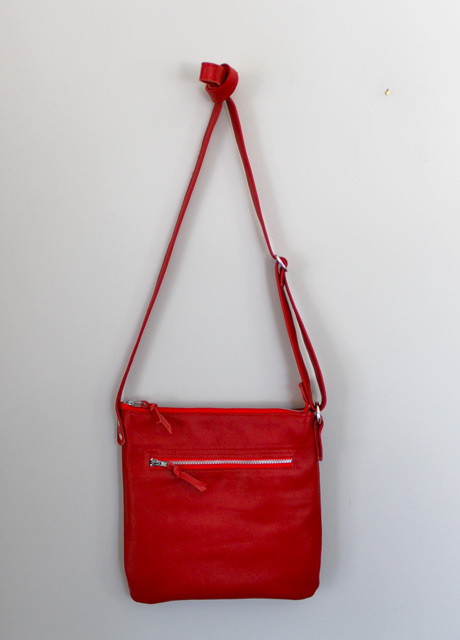 But in the meantime, here are two new red bags in familiar shapes. 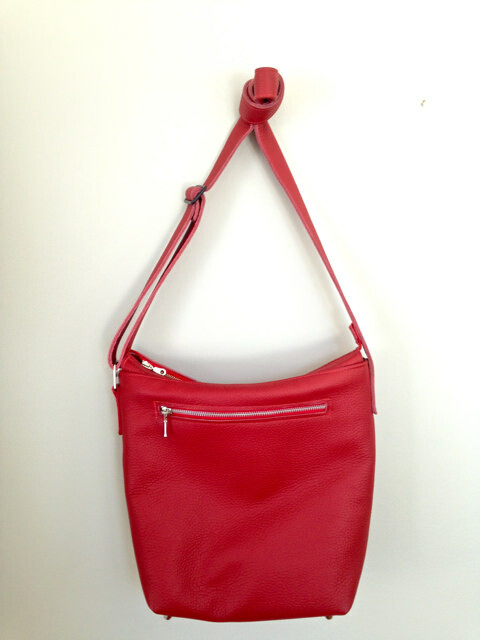 The first is the Sherbrooke, this time in red. 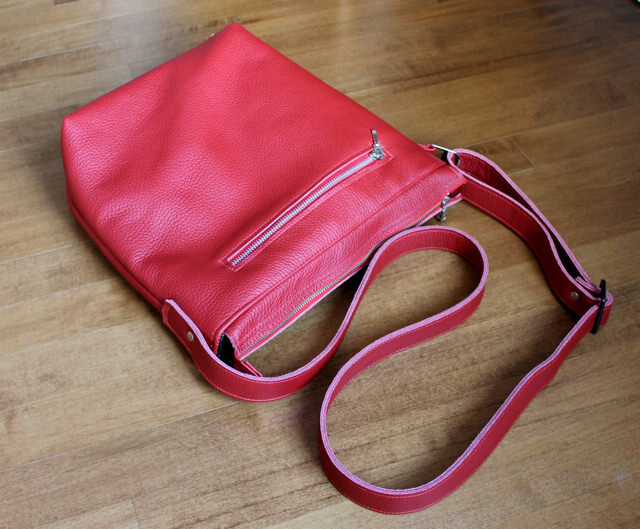 This is a great everyday bag with a zipper pocket on the outside and three slip pockets on the inside. It has a lean profile, easy to take anywhere. 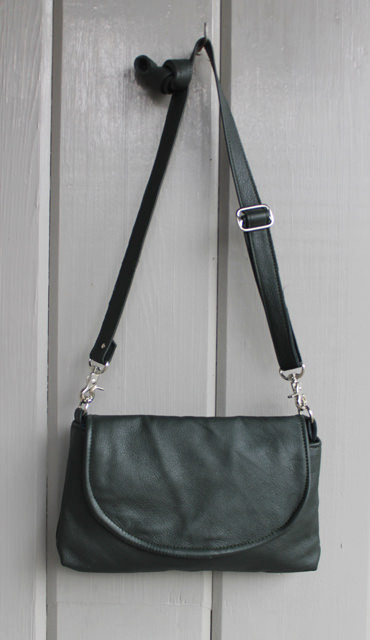 The strap is adjustable, the zippers high quality metal and the lining cotton in a great jigsaw pattern from England. W 10″, H 9″. I’ve been under the weather–living through the usual bout which comes from fatigue, too much time on planes and in airports. There are still sketches and photos of Oaxaca I would like to share, but for now, a series of pieces I have made this week, inspired by the colours of Oaxaca. 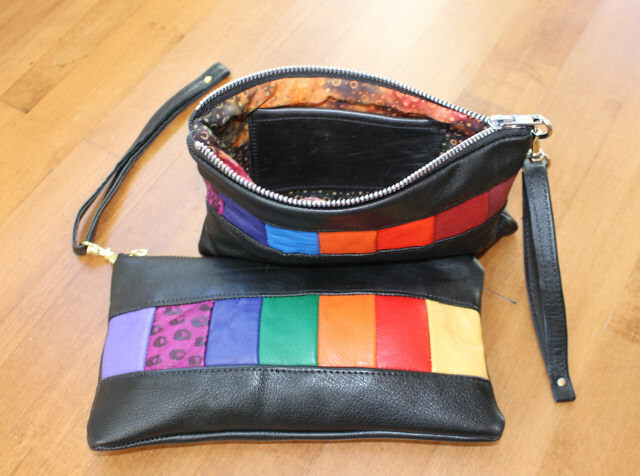 The colour spectrum pouches are designed to stand on their own or pop into a larger bag; some have wrist straps and credit card pockets. 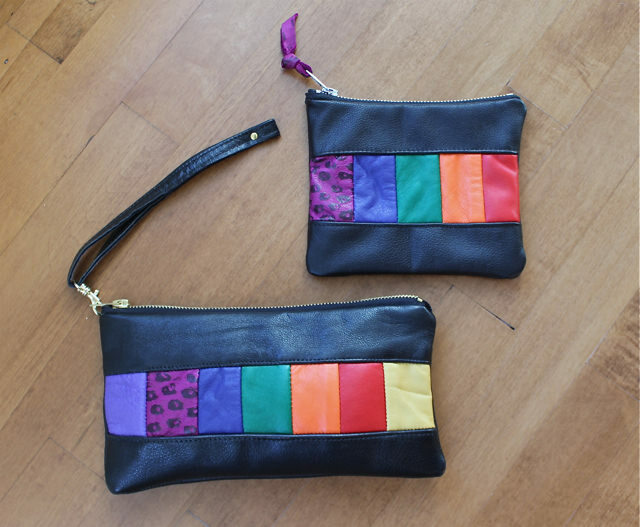 The small change pouches below are an homage to the local craftswomen who weave tiny pouches on their back strap looms. 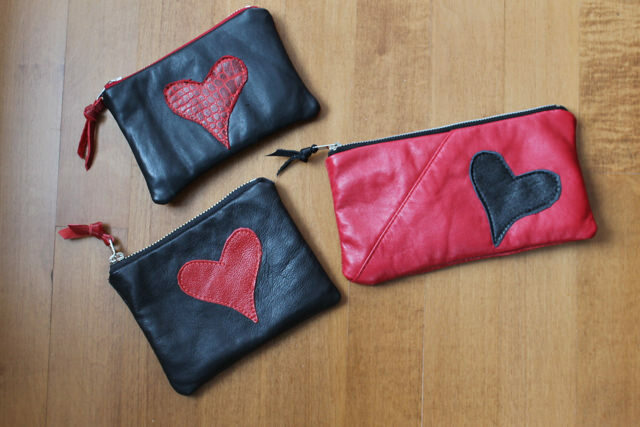 All these pieces are all made from recycled leather, are lined with cotton prints and have durable metal zippers. We are now at the end of our Oaxaca holiday and in the airport in Mexico City for a 9 hour wait. This is a perfect opportunity to do a blog post and maybe some sketching. I have so many photos and sketches on my ipad, but I’ll just do a bit now. Pablo Gonzales Marsch is a highly respected guide in Oaxaca as was his father before him. 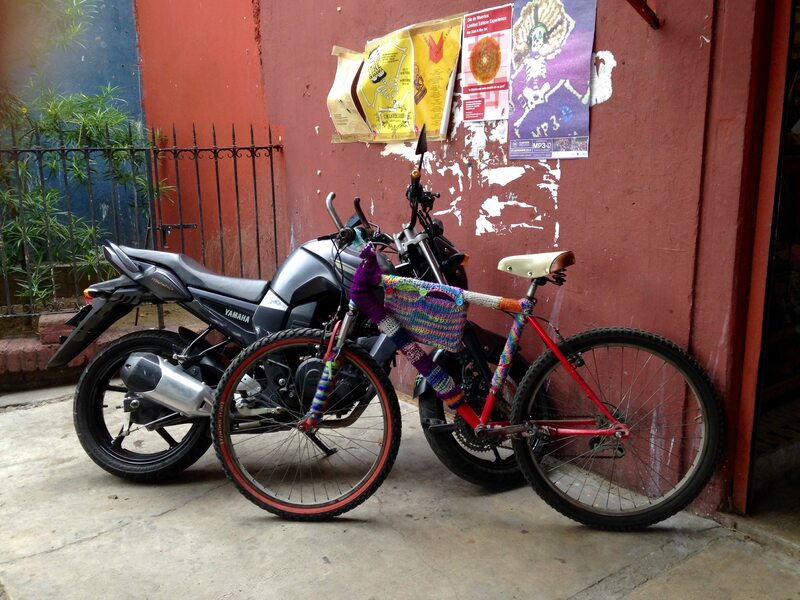 Last Wednesday Pablo took us to two villages in the Tlacolula Valley outside Oaxaca. 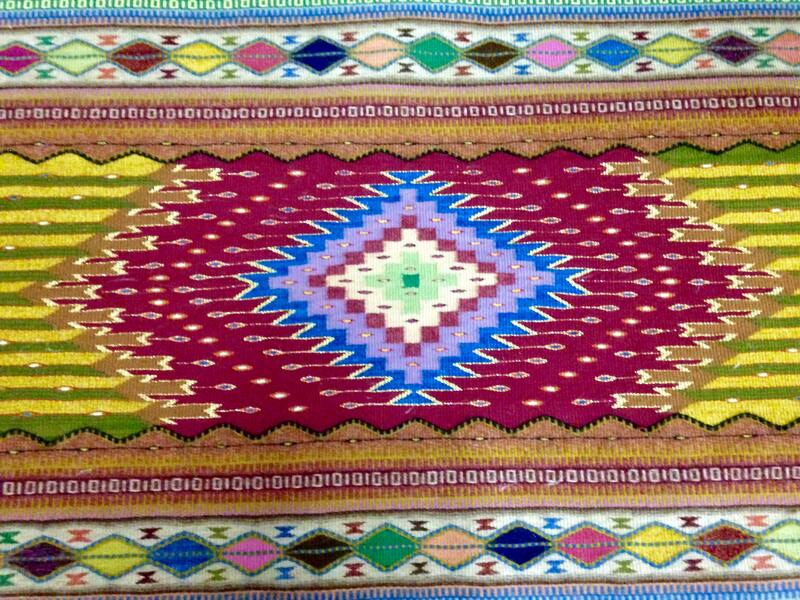 The first was Teotitlan del Valle, the weaving village. Every family there seems to weave; carpets hang outside each household, reds, blues and golds in intricate geometrics, echoing the designs of the sacred buildings at Mitla and Monte Alban. We visited the studio of Jacobo Mendoza Ruiz and his wife–an airy place with four or five large looms, all with work in progress, a showroom and a dyeing room. We had the most informative session on natural dyeing with cochineal, indigo and a local plant which gave a wonderful yellow colour. And then we were able to see the prize winning work of Jacobo and his family. 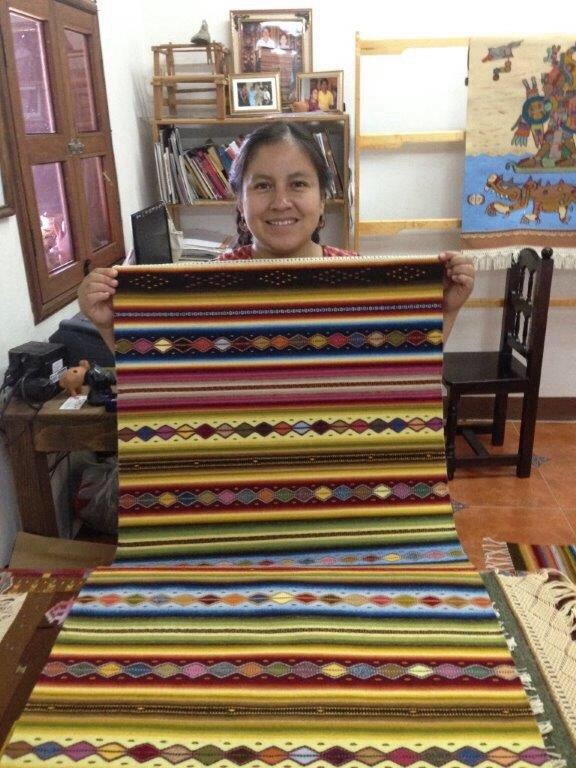 The whole family is involved in producing woven pieces, but the children, late teens, will also go away to school, Jacobo tells us, marking a change in tradition. It will be their choice whether they follow the family tradition or strike out on their own. Palbo explained that this is the first generation to have this choice. 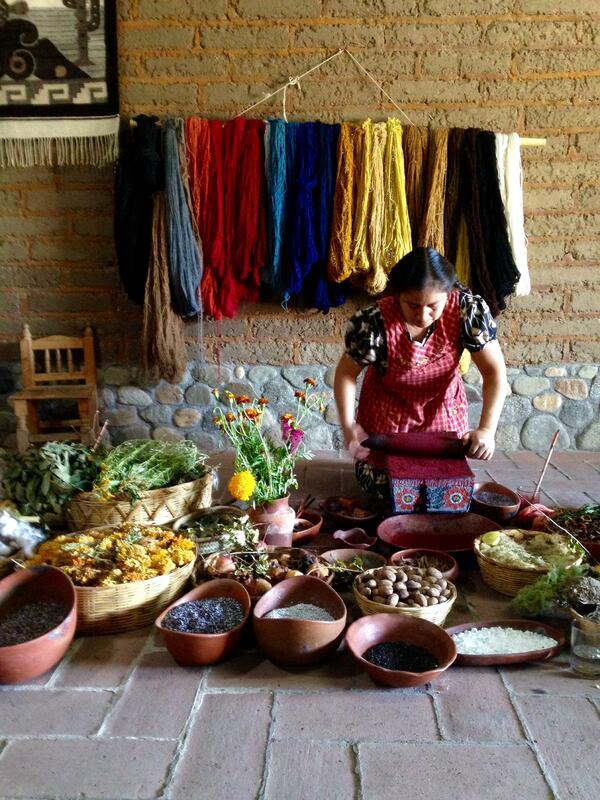 Here Maria Luisa is crushing the cochineal to make the beautiful red colours. Behind are the skeins of newly dyed wool. And below is Maria Luisa with one of her beautiful rugs and one of Jacobo’s award winning rugs, woven with gold thread highlights. 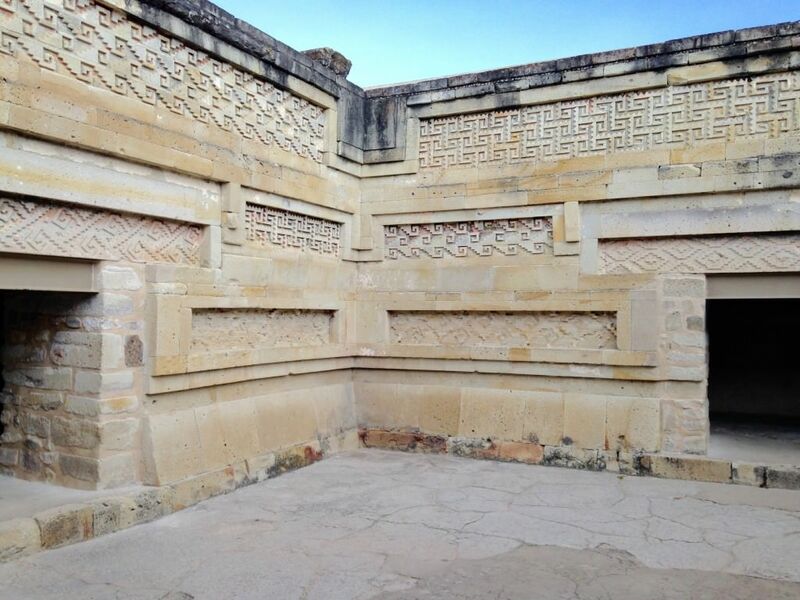 The second half of the day (after a delicious lunch at a road side restaurant) was spent at Mitla, the Zapotec site with walls of complex geometric designs constructed of finely cut stone pieces fitted together without mortar. 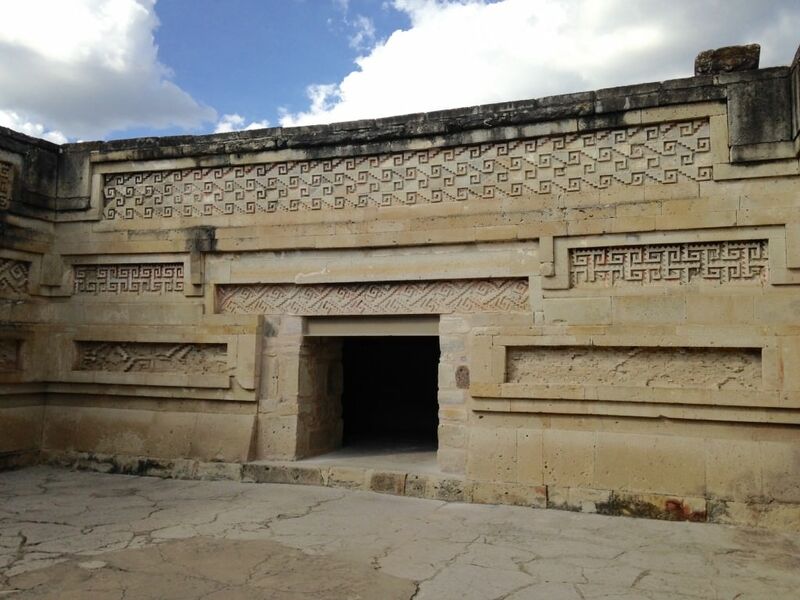 The Zapotecs had no iron or bronze to cut the stone–so the wonderful precision of the designs as well as their longevity is mind-boggling. Oliver Sacks, in his Oaxaca Journal explains that the Zapotec equivalent for metal was the volcanic glass, obsidian. As I study the designs and copy them in my sketchbook, I start to think of a new hooked rug, or maybe even the border on my current rug. I’ve already decided that one of the birds at Monte Alban, the other archeological site outside Oaxaca, will be my signature of that rug. 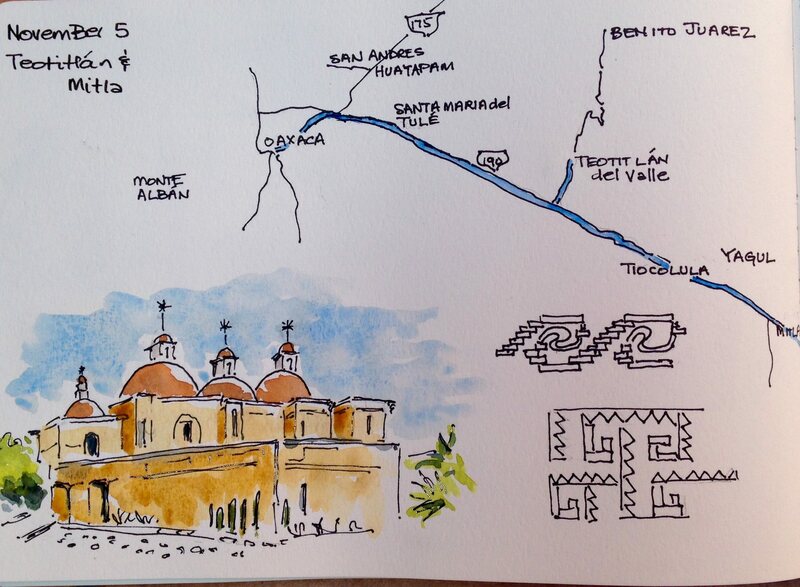 As we make our way back along the highway the 50 or so kilometers to Oaxaca, my mind is full. Colour, pattern and design dominate, but I am also haunted by thoughts of the Spanish invasion and the wilful destruction of such great beauty and skill. Before we leave, Pablo shows me the evidence that the Catholic church in Mitla was built using stones from the Zapotec sacred sites. I love sketching and I love good coffee. 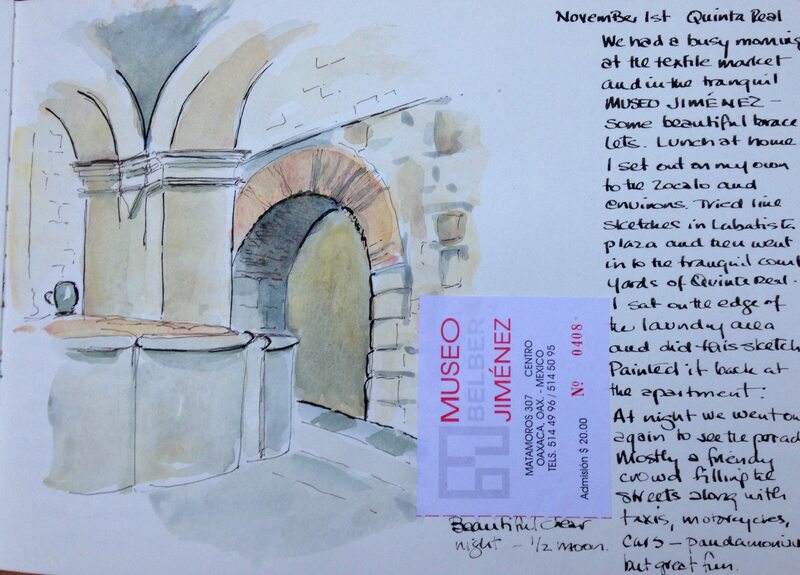 Oaxaca gives wonderful opportunity to indulge in both. Yesterday, I spent the day walking, sketching, visiting cafes and walking some more. I carry my small plastic stool attached to my backpack–I make quite an odd sight for sure–but the stool allows me to sketch where I like and not rely just on cafes or benches., although there are lots of both in this city. 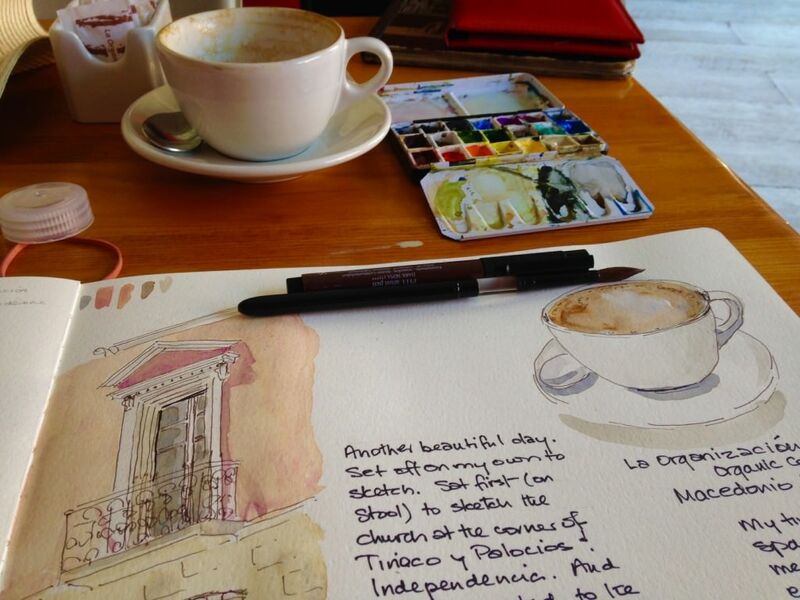 Above is my sketch from the charming cafe, La Organizacion, in the centre of the old city, just behind the beautiful Macedonia Alcala theatre–a great peach coloured building across the road. 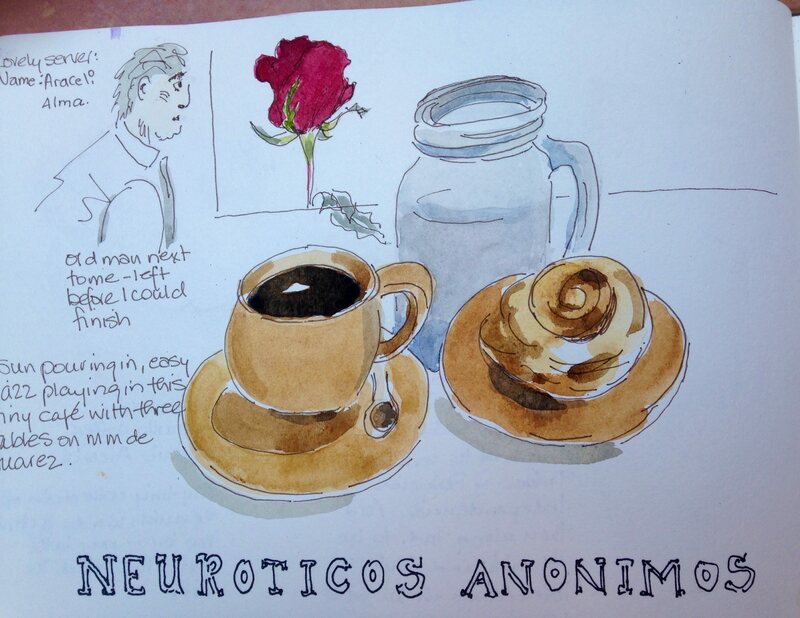 Below is a sketch from one of my favourite cafes, Alma de Cafe. This cafe, further north of the city centre, has only three tables and fitting my paints and sketchbook on the table is a squeeze, but the friendly atmosphere and delicious coffee and baking makes it well worth it. Alma herelf was there today and signed my book along with the other server, Araceli. And across the road is Neuroticos Anonimos in case I need it! 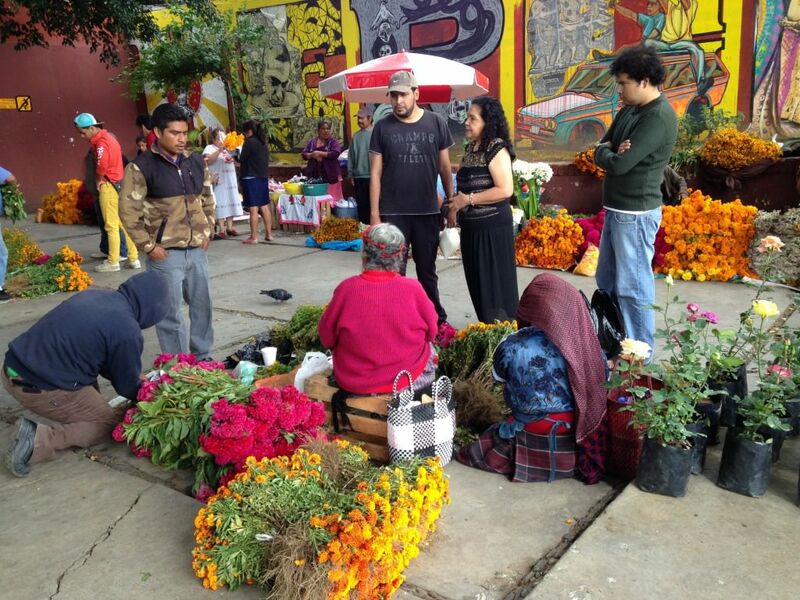 Oaxaca has many markets and I have visited most of them–but the Sanchez Pasques seen below is my favourite. What a wealth of colour! 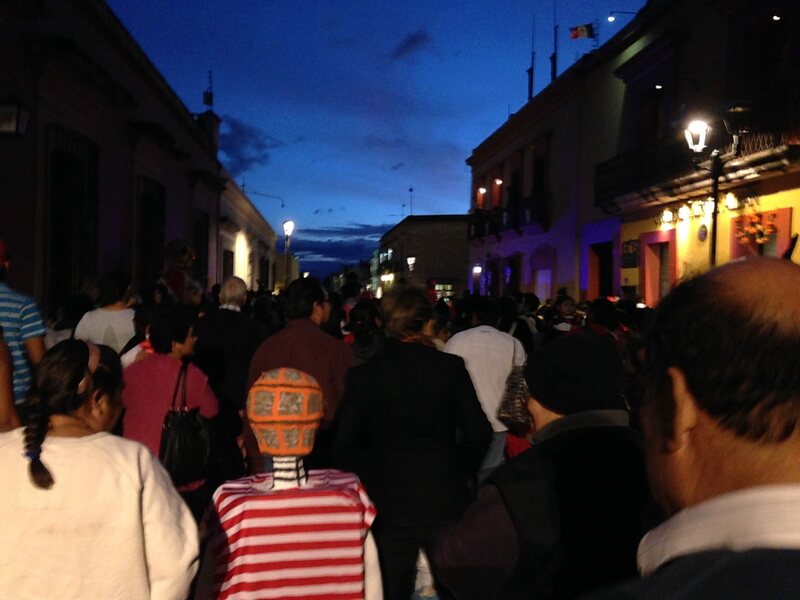 But Oaxaca has great quiet beauty as well. 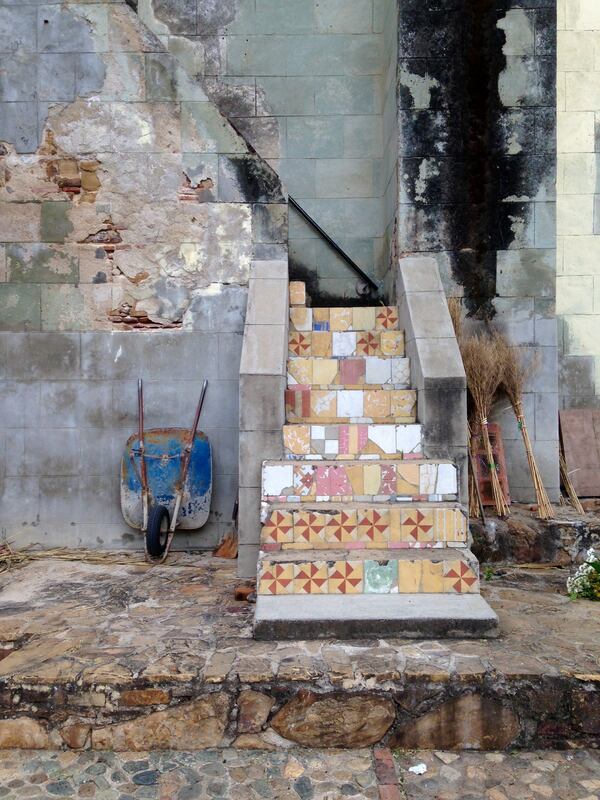 The limestone and tiles tell such stories. 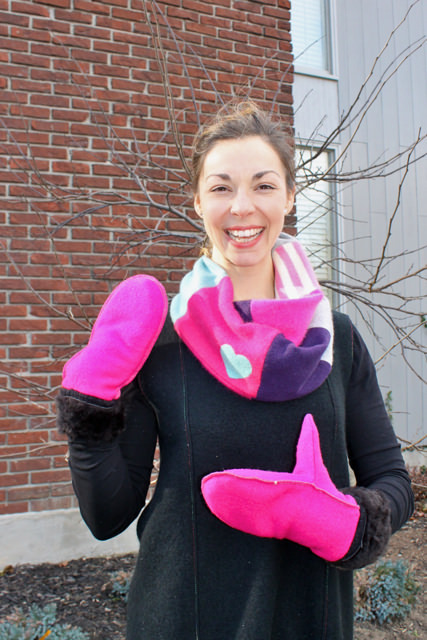 And I had to include the bicycle which combines, with fun and ingenuity, two of my loves–wool and cycling. And a sketch done in the quiet recesses of a lovely hotel. 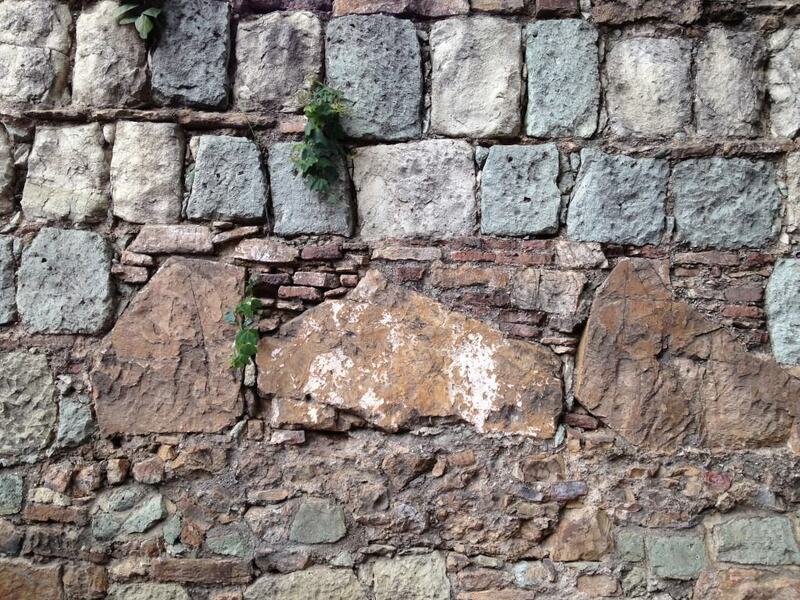 This was once a convent and this area was the laundry. 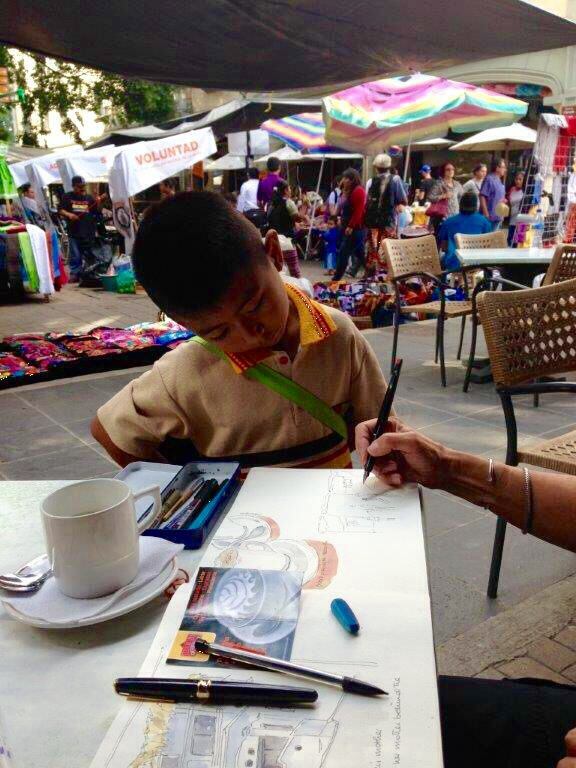 Sketching anywhere in Oaxaca means you are not alone. People stop to take photos and ask questions, always politely interested. Here I am sitting in the Zocalo with very interested company. 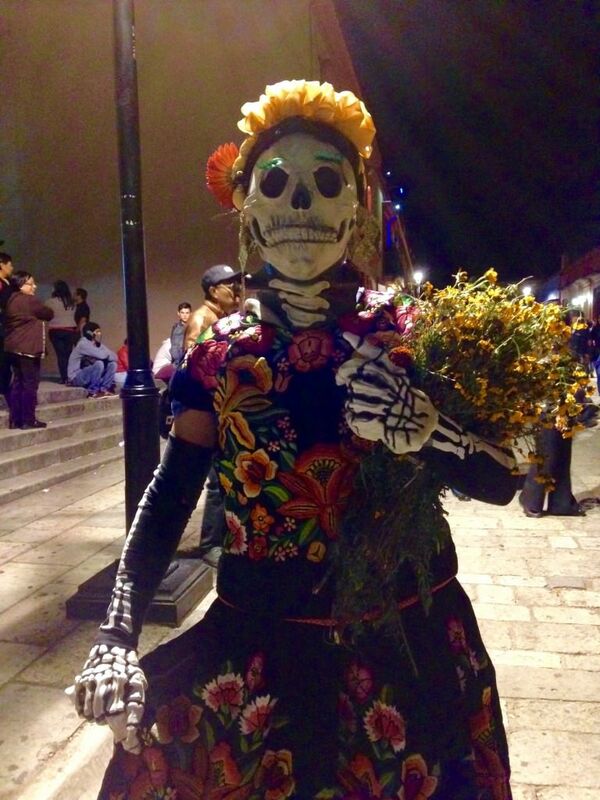 The city is alive this weekend with celebrations of el Dia de los Muertos. 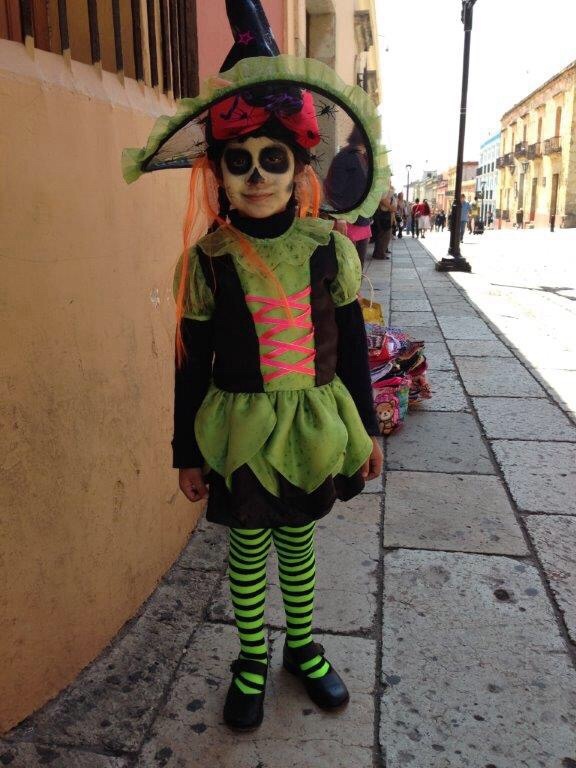 Last night we joined the parades–brass bands, banners, fireworks, parents carrying children dressed as skeletons, catrinas and devils, others walkling alongside with white faces and dark eyes. There is a sense of reverence and awe combined with great celebration. We joined the crowds at the Panteon, a huge cemetary just outside the centre of town. 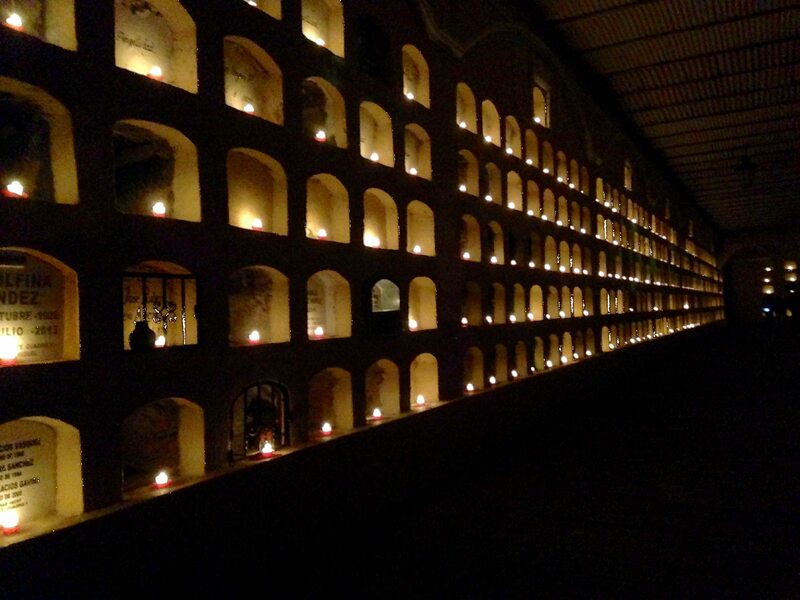 Inside the walls there were endless candles and marigolds and sombre music and outside a carnival, including ferris wheel, games and wonderful street food. The adorable sponge-bob, below, had a skeleton face and tiny shining eyes peering from a slit in the striped box body.